You have 30 seconds to defeat as many opponents as possible. Good luck. 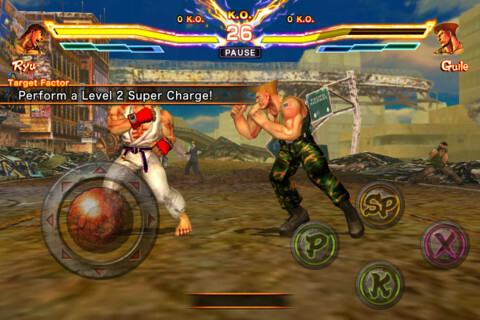 Capcom released an iPhone and iPad game titled, Street Fighter X Tekken Gauntlet, a free-to-play brawler clearly designed to push the more full-featured Street Fighter X Tekken Mobile. What we have is a bonus mode of sorts, where gamers pummel a series of opponents, one after the other, within 30 seconds. Pulling off various objectives adds precious seconds to the timer, and there are only two playable characters, Street Fighter's Ryu, and Tekken's Kazuya. First impression: it's just as sluggish as its smartphone and tablet counterpart, and the goals are tough to pull off, at least initially. With this in mind, we cannot stand the fact that Capcom lists the current objective on screen at all times, since it obscures the action.